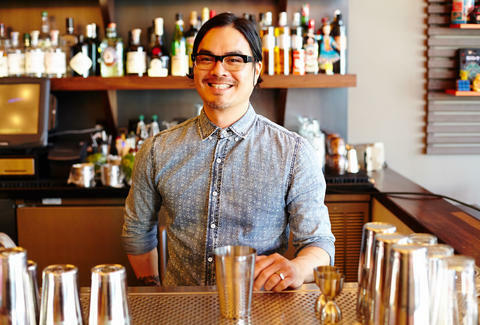 Despite the high-end ingredients and inspired flavors, Danny delivers something often sacrificed in the world of fussy craft cocktails -- a sense of fun. It doesn’t get more playful than the fancy Jell-O shots that are basically roller coasters for your taste buds. If only history was as much fun in high school as it is at Jennifer's Fort Mason tipple-ry, where a unique cocktail menu celebrates the legacy and evolution of classic cocktails. Drinking at one of SF's best openings of 2014 isn't just fun, it’ll probably make you smarter -- at the very least you'll know what dirty martinis tasted like 250 years ago. With an extensive, generous happy hour menu on weekdays from 5-8pm, Blackbird feels at once like a cozy neighborhood bar and a hub of cocktail innovation, where Matt Grippo tinkers with new concepts and flavors. His latest creation: a limited-edition, off-menu selection of cocktails inspired by Game of Thrones. Specialty cocktail: The New Orleans Iced Coffee, a boozy carbonated cold brew coffee with bourbon and chicory served on draught. 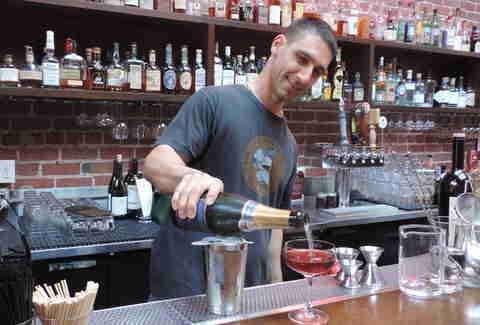 Located on cocktailing epicenter Geary, it might be easy to overlook The European in favor of the bar-of-the-moment, but that would mean missing out on Shirley’s impossibly smooth, yet booze-forward concoctions and effervescent personality. And you... maybe don’t want to do that? Specialty cocktail: The Smoke Without Fire. Smoky, yet refreshing, and super smooth, featuring Fords gin, Lucano, a spritz of Laphroaig, and rosemary sprig. What she loves about San Francisco: "I have everything I could want here and there's so much nature -- it's easy to escape city/busy life." 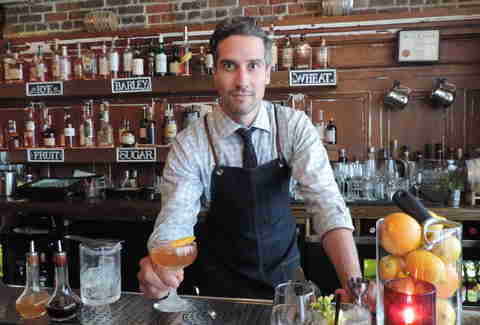 In keeping with the vibe of this revamped SF institution, Dustin’s cocktail menu merges traditional cocktails with new classics like the Milk Punch and Dark n’ Stormy Slushy -- neo-classics that've made this Embarcadero watering hole worth, uh, watering at. 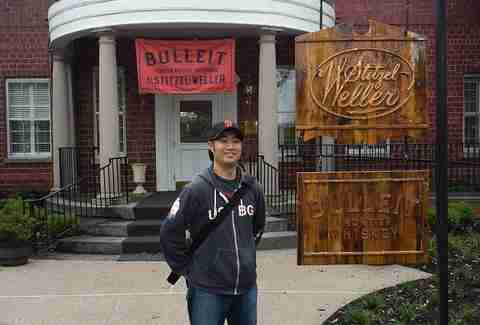 What he loves about San Francisco: "My favorite thing about San Francisco is how quirky it is. We get a lot of tourists at the restaurant and inevitably a group of naked rollerbladers or something like that will go rolling by because you know... San Francisco. The out-of-towners will look on in disbelief. 'Does that happen often??' they'll say. My response is always the same: 'Welcome to San Francisco.'" 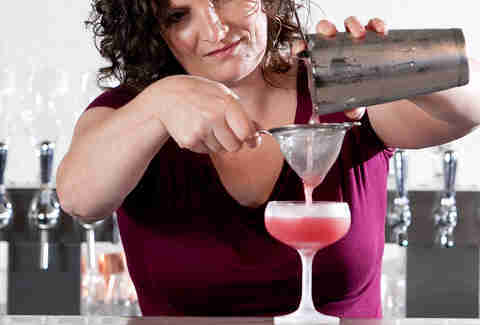 Kate Bolton’s inspired cocktail menu with food pairings ensures the drinks are as much the main course as the entrées. And, thanks to her culinary chops, seasonal produce, herbs, and spices are stars in her libations. You may forget you’re in the middle of the FiDi thanks to Natoma Cabana’s sunny poolside vibe, comfy lounge chairs, lush foliage, and Eric’s deconstructed tropical drinks that taste like vacations-in-a-glass. 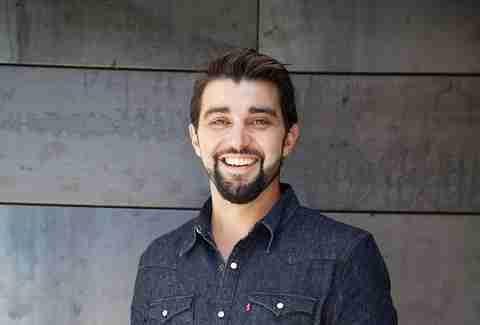 What he loves about San Francisco: "In my opinion SF is currently the most interesting city to live in, architecturally, culturally, and it leads the pack in innovation, I don't just mean tech, I think we also set the mark in hospitality. I have the feeling that someday I'll look back and feel lucky that I had a front row seat for this era in SF." Winner of this year’s all-female speed bartending competition, Jacquelyn is officially the fastest bartender in the 7x7. When you want to drink whiskey in dark corners, there’s no better place than this vintage-looking hotel bar that feels way cooler than your average hotel bar. The cool-factor might have something to do with Josh, who makes everyone feel like a regular, no matter how busy it gets. Though the Redwood Room is one of the oldest bars in the city, Anthony Kim keeps things not-at-all-old with a continuously evolving menu with subtle nods to the city’s cocktail history. Specialty cocktail: Pan-Pacific Sling. In honor of the CLIFT’s centennial, it fuses elements of the Pisco Punch, a San Francisco classic, with a Singapore Sling, which was created in 1915, the same year that San Francisco hosted the Pan-Pacific Exposition and that CLIFT Hotel opened. It contains Campo de Encanto pisco, pineapple gomme syrup, Cherry Heering, lemon juice, and a touch of Fernet Branca as a nod to current-day San Francisco. 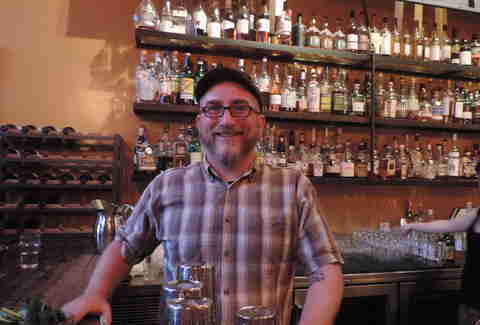 Where he drinks when he's not working: "I'm partial to a classic Boulevardier, plus I love stopping by ABV, Dirty Habit, Blackbird, Comstock Saloon, Elixir, or Smuggler's Cove and trying all the great cocktails created by the talented Bay Area bar community. That being said, you can't beat Philosophers Club for a shot and a beer." What he loves about San Francisco: "I love the idea of San Francisco. I love that it's a place where weird is good, where people come to build their dreams, where anything seems possible. And while the reality of living here can sometimes be difficult, I love that it's a place that continues to attract dreamers." Alembic has been delivering big drinks and small plates in a rustic setting for more than 10 years, making it an icon of San Francisco’s cocktail culture. At the helm is chef, bartender, and entrepreneur extraordinaire Larry Piaskowy, who somehow manages to find the time to create cocktail pairings for Girl Scout Cookies in between slinging drinks at the always-packed bar and launching his own line of bar-friendly spreads served in mason jars. 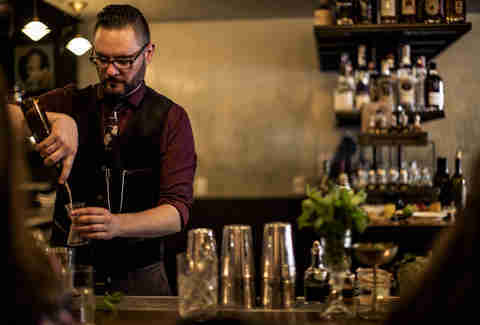 Where he drinks when he's not working: "My favorite cocktail in SF is the Leather Bound Book at Blackbird. Not on the menu, but they will usually make it for me anyway. Tastes remarkably like the name implies." His new bar might be hard to find, but that hasn’t stopped it from becoming everyone’s new favorite tiny cocktail-and-oyster den virtually overnight. 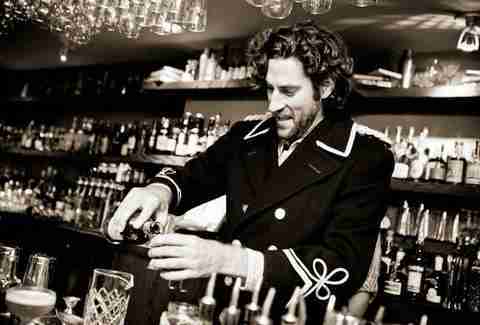 Mo and partner-in-drink Brian Felley are the bartenders leading the charge. Specialty cocktail: Dry gin martini, a little citrus bitters, a bit of a round-bodied vermouth with London Dry gin and Salers Gentiane. Finished off with a homemade cocktail onion and a twist. You know her work from cocktail hot spots such as 15 Romolo, Novela, and Alembic, and now Old Bus Tavern, opening in May, where you’ll find her mixing house-brewed beers with bourbon, tequila, and other Southwestern flavors. 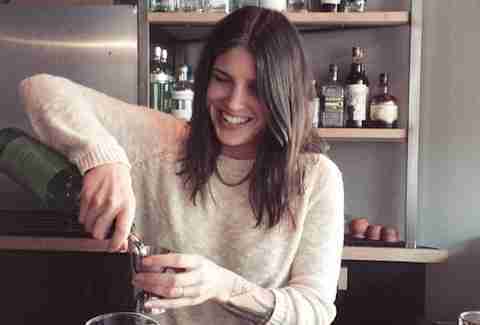 Where she drinks when she’s not working: “My absolute go-to is Nopa. I love it there." 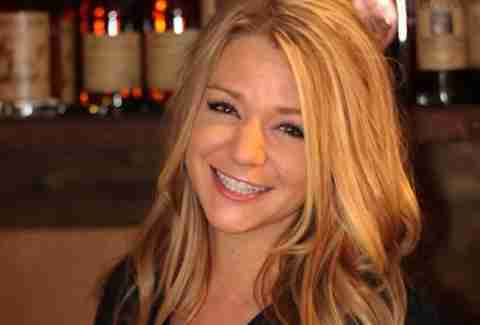 What she loves about San Francisco: “San Francisco is an incredible place for so many reasons but one of my favorite things as it relates to food and drink is that, agriculturally, we have whatever we want at our fingertips." 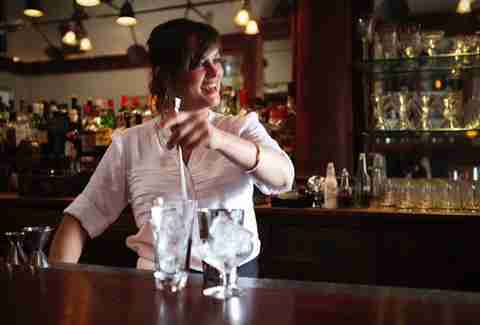 You know you’re in competent hands when your bartender has the nickname “Lady of Lushery.” Catch her at this turn-of-the-century upscale saloon slinging drinks faster than Old Western sharp shooters. 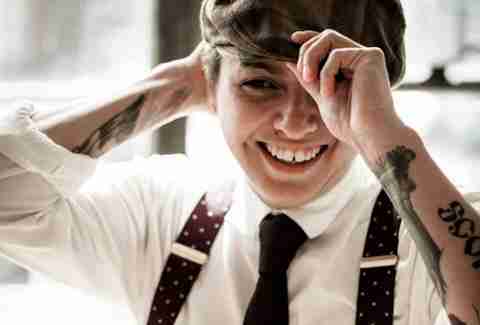 Amy Copperman is a writer in San Francisco. Cocktails are the way to her heart. Follow her on Twitter.